I understand that I’m a 35 year old grown woman. But here’s the thing, I DON’T CARE! I love Disney and I’m not ashamed to say it. My husband, Ross, and I are planning a weekend trip to Disney World and I can’t wait. I’m buying a pair of ears for every damn park we go in and (Ross doesn’t know this yet but) I’m buying at least two Vinylmation figurines. That’s right, Disney’s got me, hook, line, and sinker. Let’s start with the park. We’ve been to Disneyland, and I was at DisneyWorld when I was little (I don’t really remember it and that might be a sin – I haven’t found it in any scripture anywhere but I’m sure it must be there…right?). 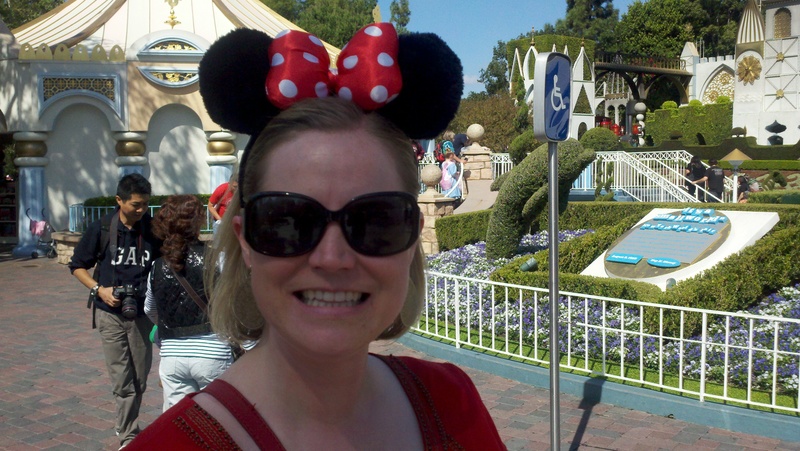 In 2010 and 2011, I went to Disneyland twice in a 12 month period and that’s saying something for a girl from Ohio. The time my husband and I went (yeah, that’s right! I went once without him), we spent the day at the magic kingdom and I ran around like a cracked-out six year old. See for yourself! In fairness to my husband, that was a $10 hamburger. Doesn’t matter though, he still tried like hell not to smile on the tea cups. Who does that? You have to smile on the tea cups! I think its a law. He has our itinerary for each day planned out and this trip is four months away. He’s already dictated the paths through each section of each park and where we need to get fast-passes. This damned thing is 864 pages of craziness that my husband has taken on like it was gospel. Little does he know that his entire plan is going to be blown the hell up as I spend the first two hours of each day going from gift shop to gift shop. Ahahahahaahaha! Next, I’m obsessed with Disney’s ridiculously ingenious idea, Vinylmation. I LOVE these things. I don’t think Disney needs anymore cult followers but I’ll do my bit by giving you the link. LOL! I bought one, hoping it was Lucifer from Cinderella because here’s the thing, you don’t know which one you’re getting. So if you don’t get the one you want, you just keep buying them! Well, I got Lucifer and one of the cards from Alice in Wonderland. I had to buy two, it evened up my chances. You would’ve done the same! Don’t judge. Anyway, I was too excited and Ross poo poo’d my purchase saying that it was a waste of money. I agreed and that was the end of it. A few months after that, I was headed to Polaris Shopping Center and there’s a disney store in the mall. I thought I could sneak in there, see what they had and get one…or two. I parked and then decided I couldn’t deal with the mall. When I got home, I told Ross about how the idea of the mall and how the thought of going in made me a little anxious and how weird that was. So, a few weeks later, he went and bought me three. THREE! I said, “you’re right, honey” and didn’t argue. Then, for my birthday, he bought me another one. Isn’t he cute? Then for Christmas, he bought me another two. So, for not becoming a “thing”, he’s kinda making it a “thing”. That’s why I love my husband! He knows the way to a girls heart. Previous PostNew Year’s ResolutionsNext PostWho Remodels a Laundry Room? I do! That’s Who! OMG I love your “thing”. 🙂 And kiddo and I went there TWICE, two years in a row, and we loved it.